Area janitors are fighting back against instances of unpaid overtime wages, denial of breaks and retaliation against union organizers. 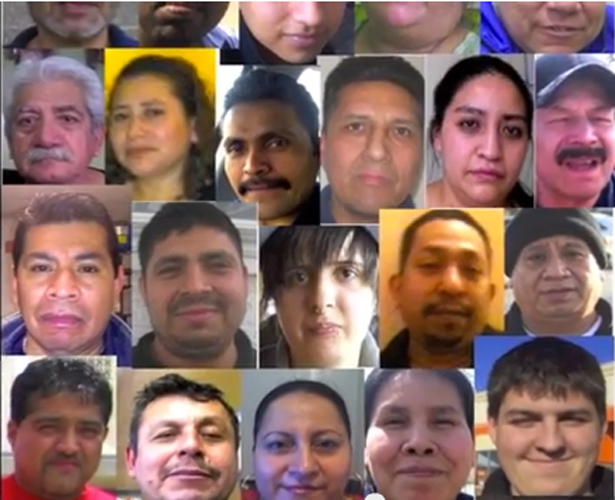 Faces of janitorial workers who plan to strike. Watch the video. Minnesota retail janitors called a forty-eight-hour strike today, demanding that the cleaning subcontractors that employ them get out of the way of efforts to unionize. Maintenance staff that clean mostly Target stores but also Sears, Kmart, Kohl’s and Home Depot will picket outside Target’s flagship store in busy downtown Minneapolis, from 6 am to 10 am Tuesday. Janitors from twenty-five stores are expected to participate. Several workers will also attend Target’s annual meeting in Denver Wednesday to educate shareholders and executives about the reality faced by contracted cleaners. Unpaid overtime wages, denial of breaks and retaliation against union organizers are among the problems documented by area janitors involving subcontractors like Prestige Maintenance USA, Diversified Maintenance, Carlson Building Maintenance and Eurest Services. In January, The Nation reported that at least twenty-five Minnesota janitors filed OSHA complaints, some of which accused Target retailers of regularly locking workers indoors while they cleaned at night. Members of the Centro de Trabajadores Unidos en Lucha, a Twin Cities labor organization, have been working to organize 600 retail janitors in Minneapolis and St. Paul for three years. This is the non-union janitors’ second strike this year. A strike in February demanded that contractors meet with workers to discuss safety and labor law violations. Tomorrow’s action specifically addresses reports of employer retaliation against workers participating in CTUL actions. Last week, Anisca Floor Maintenance agreed that it would not interfere with employees’ efforts to form a union. They are the first retail cleaning company in Minnesota to do so. Josh Eidelson has been reporting on the spread of strikes among non-unionized retail and food service workers.